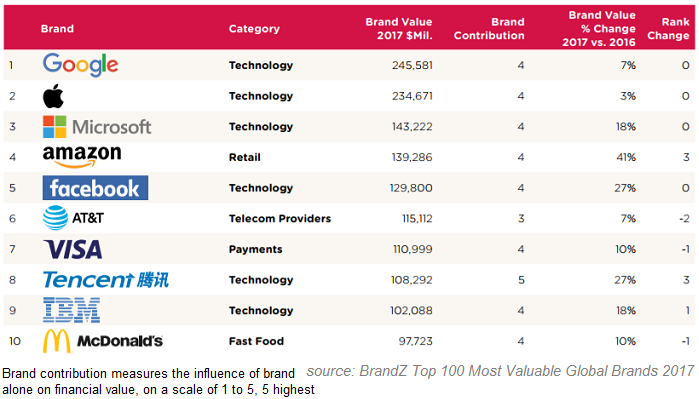 It is also very interesting to see, that 25% of the total value of the 100 most valuable global brands is made up of the combined brand value of the tech's 'Fearsome Five', emphasising their dominant positions in the modern business landscape. David Roth, CEO EMEA and Asia of The Store WPP said: "Dubbed the 'The Frightful Five' by some, the tech giants that head the rankings are more like the 'Fearsome Five' to their competitors, given their huge brand power and a seemingly unassailable market position." Doreen Wang, Kantar Millward Brown's global head of BrandZ said: "This is the era of internet giants that have developed ever-growing ecosystems that touch and connect consumers, with the overall aim of making life easier, simpler and better. Technology with the consumer at its centre has redefined our expectations, and we now take for granted that products, services, tools and content are immediately available at our fingertips." This year, 24 brands from the APAC region made it into the top 100 - mostly concentrated around China. Two of the 13 Chinese brands are: Tencent (position 8) and Alibaba (14). Tencent, which saw increased use of its social platform WeChat and entered the top 10 for the first time, with a brand value increase of +27% to USD 108.3bn. Overall, Retail was the fastest rising category, increasing +14% in value over the last 12 months, driven by e-commerce brands such as Amazon and Alibaba which, like many native internet companies, continued to add physical stores to their sales channels. Overall the value growth of pure online retailers has increased +388% since 2006, while traditional retailers dropped -23% as they took longer to adapt their offering to include online. The list is now in its 12th year. It combines measures of brand equity based on interviews with more than 3 million consumers about thousands of brands, with analysis of each company's business and financial performance, using data from both Bloomberg and Kantar Worldpanel. Disclaimer: Ralph Gollner hereby discloses that he directly owns securities of some of the stocks mentioned above: Microsoft, Apple, Google, Amazon, Facebook, Mc Donald's, Alibaba, Mastercard and PayPal as per 15th September 2017. Disclaimer/Hinweis nach §34 WPHG zur Begründung möglicher Interessenkonflikte: Aktien von Microsoft, Apple, Google, Amazon, Facebook, Mc Donald's, Alibaba, Mastercard und PayPal, Unternehmen die in diesem Blogeintrag/Artikel behandelt/genannt wurden, befinden sich aktuell im "Echt-Depot" von Mag. Ralph Gollner - per 15. September 2017.